When Massachusetts Senator John F. Kennedy was elected President in 1960, he captured the hope and imagination of America in a way few politicians ever had. 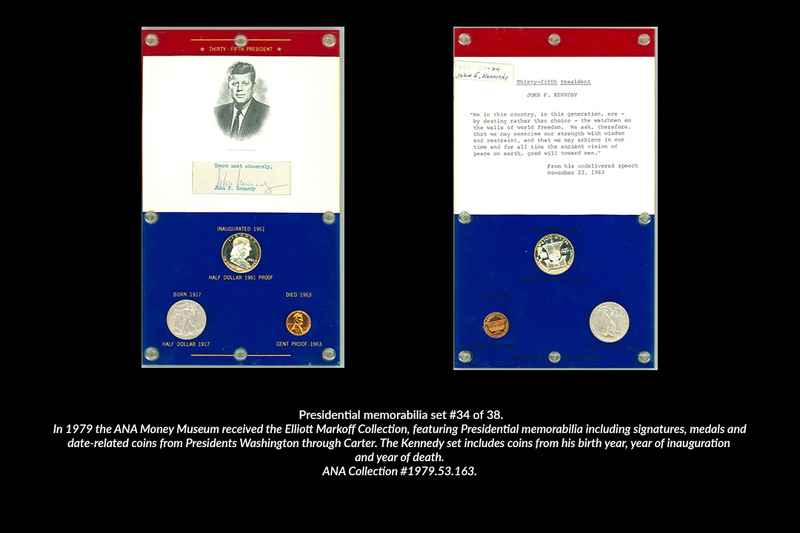 Just 43 at the time of his election, his optimism, young wife and children, and powerful political family created a sense of idyllic happiness in his administration later referred to as a modern-day “Camelot.” The Money Museum holds many coins, medals and ephemera honoring our 35th President. Before launching his political career, Kennedy was a Naval Lieutenant in the Pacific during World War II and served as commander of Patrol Torpedo Boat 109, which was destroyed in August 1943. He saved an injured crewmate and led his men to safety on a small island. 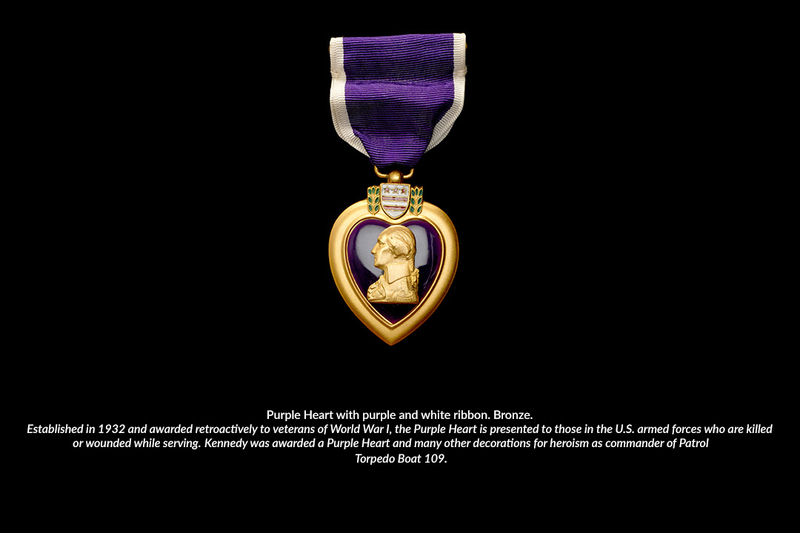 For his heroism and service, he was awarded numerous medals. 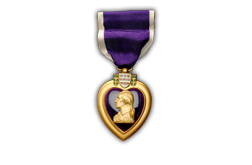 Examples of these medals from the ANA’s collection include the Navy and Marine Corps Medal, Purple Heart, Asiatic-Pacific Campaign Medal, Bronze Star and the World War II Victory Medal. 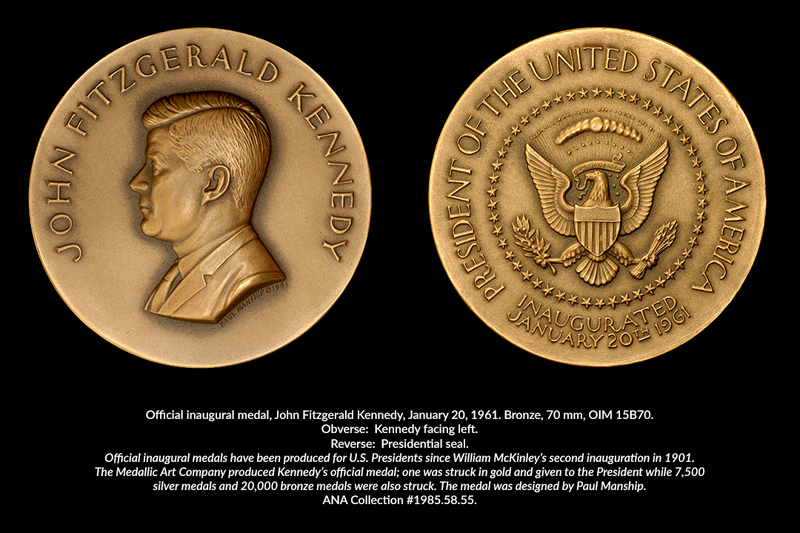 President Kennedy’s most famous call to civic service came in his Inauguration day speech in 1961, when he challenged Americans to “ask not what your country can do for you, ask what you can do for your country.” The ANA has two medals commemorating that day: the official medal designed by Paul Manship and produced by Medallic Art Company; and the U.S. Mint inaugural medal, designed by Gilroy Roberts and Frank Gasparro. 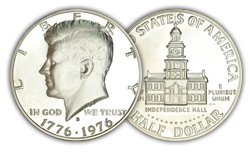 Roberts’ obverse portrait was adopted for use on the Kennedy half dollar. 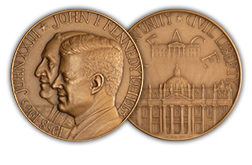 Kennedy’s belief in a service-centered society culminated in March 1961, when he established the Peace Corps, an organization that has brought more than 200,000 Americans to 140 countries. 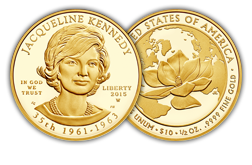 His sister, Eunice Kennedy Shriver, was a champion for children's health and disability issues and founded Camp Shriver in 1962 – which became the Special Olympics in 1968. 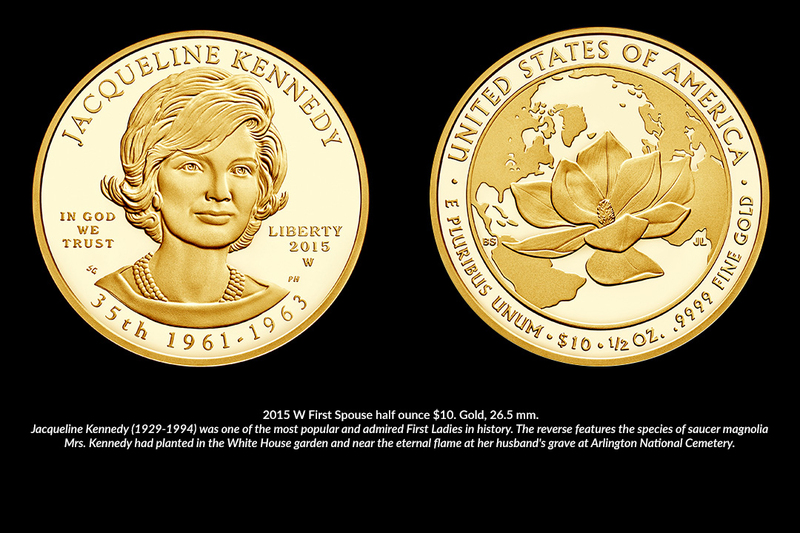 A 1995 commemorative silver dollar was released honoring Kennedy Shriver and the Special Olympics, a 1998 commemorative silver dollar honors Robert Kennedy, and a 2015 First Spouse gold coin honors First Lady Jacqueline Kennedy. 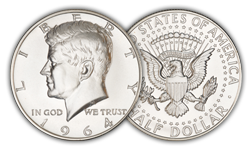 When John F. Kennedy was assassinated on November 22, 1963, U.S. Mint Director Eva Adams proposed issuing a coin to commemorate the fallen President. 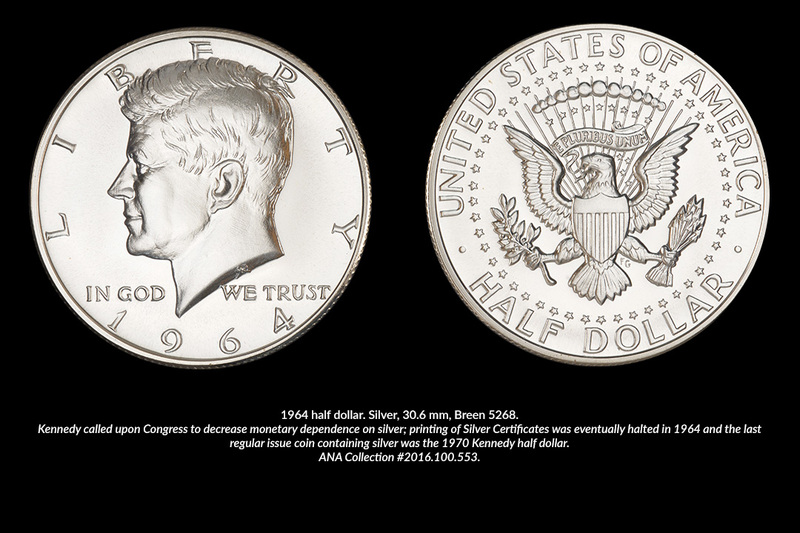 Under existing law, coin designs could not be changed more frequently than every 25 years, and the Franklin half dollar had only been minted for 15 years. 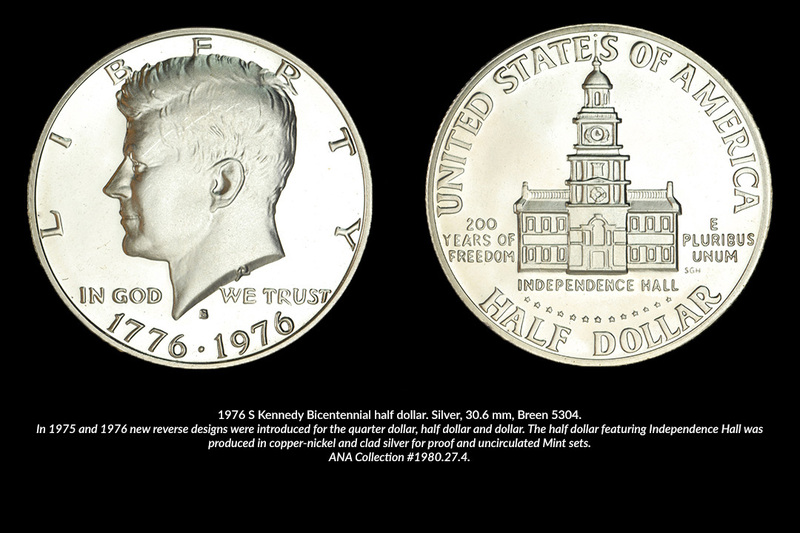 Nonetheless, Congress passed an act authorizing the Kennedy half dollar on December 30, 1963. 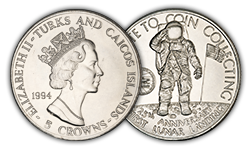 Designed by Mint Chief Engraver Gilroy Roberts, production of the coin commenced in 1964 and it remains the standard design for half dollars produced by the U.S. Mint. 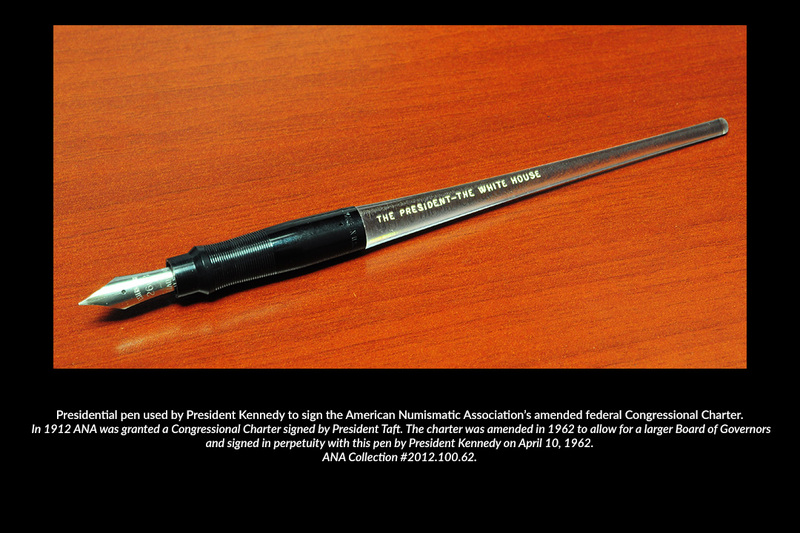 The ANA has its own special connection to Kennedy: in 1912, President William H. Taft granted the ANA a federal charter, which was revised and made permanent by President Kennedy in 1962. 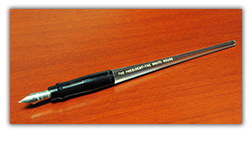 The pen he used to sign the charter into law is in the Money Museum's collection. 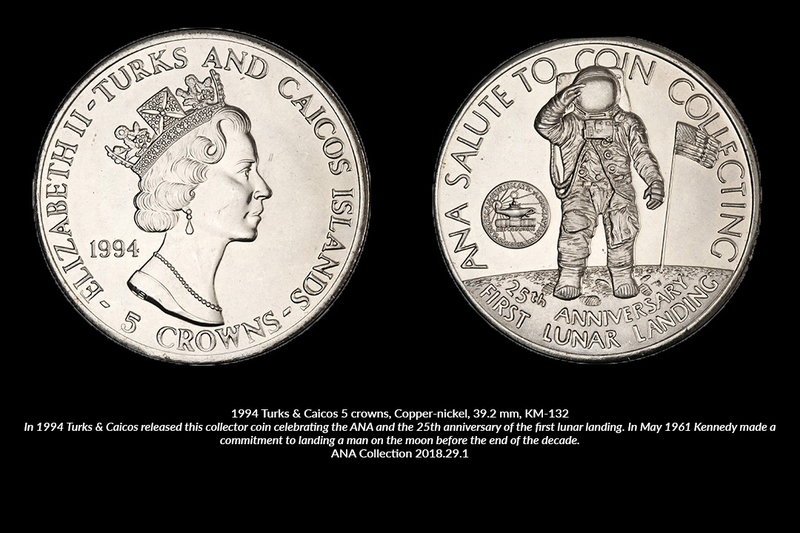 View it and other ANA Kennedy-related items using the gallery below. 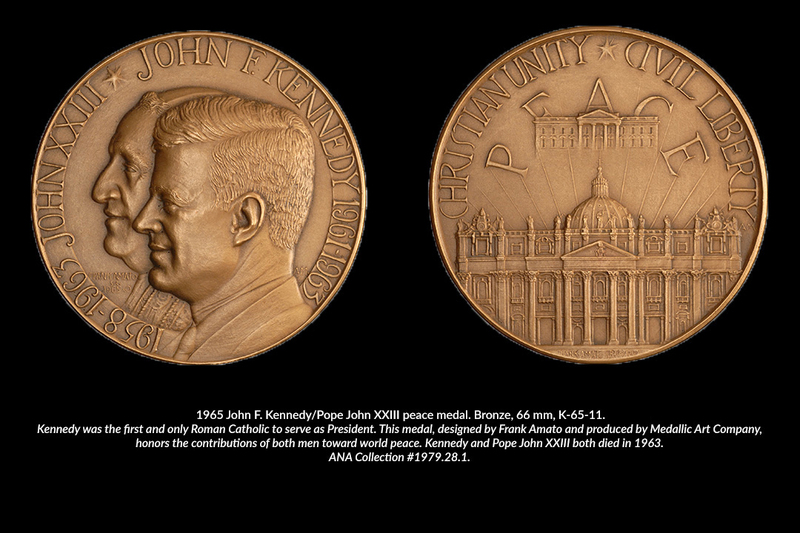 The Kennedy World in Medallic Art, by William R. Rice, Whitman Publishing, 2014. Call # RA60 R4. 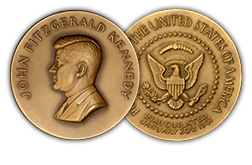 The Medallic Portraits of John F. Kennedy, by Edward C. Rochette, Krause Publications, 1966. 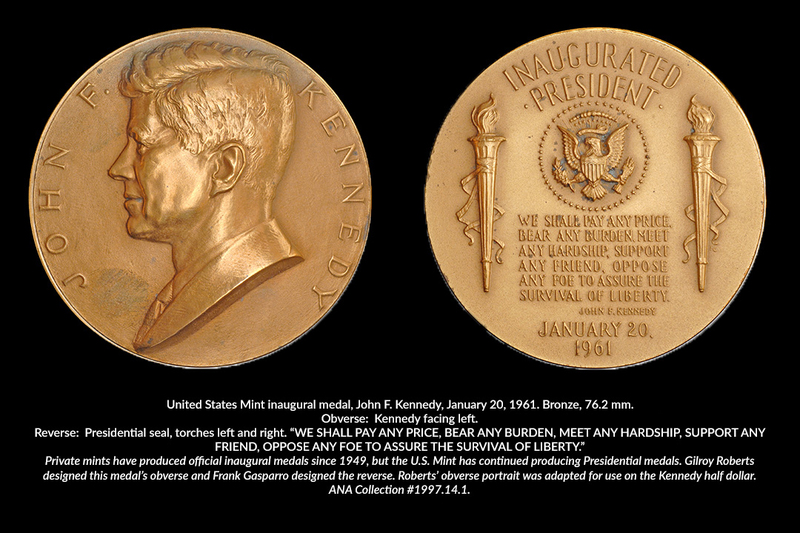 I noticed that the ANA collection description in this blog is lacking a President Kennedy Appreciation medal ( Rochette K-62-1) that was designed byFrank Gasparro and struck by the US Mint (mintage 300). Contact me if the ANA collection needs a specimen donated. Great blog. What a somehow cursed family it seems to me. So many tragedies.. Our nation could certainly use people like him today. Thanks. Really enjoyed your blog and beautiful photos. Thank you for all the research! Very well done, with lovely pics. The Kennedy reference book is a gem. 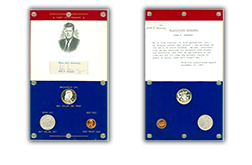 Kennedy items are highly sought by some collectors. This is an exceptionally written and researched article, indeed a tragedy had it not been for his political adjustments to get us to the moon, we would have lost the cold war, and communist Russia may still be here today. 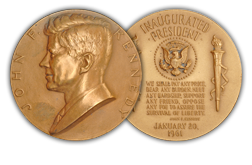 These coins and medals are amazing, and Dr. Darryl has written some good blogs writing of his presidential medals with JFK. Thank you.